Marcy at Stretching a Buck is giving away high value coupons ($1.25/1) for Pillsbury’s new Grands! Cinnamon Rolls! 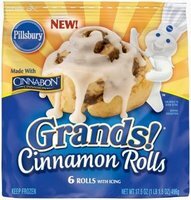 My family LOVES the Pillsbury Frozen Dinner Rolls so I’m betting these are great too! Visit her blog to enter. Ends Tuesday, November 25th!